In September 2014 Bridge of Hope Children’s Ministry organised a very successful Football & Netball tournament for the local youth to participate. Over one thousand people attended the two day event held in Kebisoni Sub County and after the event many children requested an ongoing activity. In January 2015 Bridge of Hope Children’s Ministry were able to employ two part-time youth workers to work with the most disadvantaged children and set up a weekly activity for them. 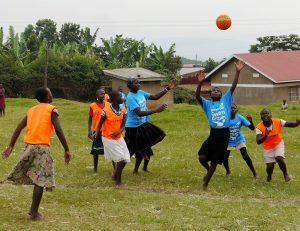 The children have fun in a safe environment, participate in structured sports and benefit from social interaction and discussions on topics such as health issues. We believe that structured sports can help shape children into healthy, social and active people. They will be encouraged to form friendships and learn new skills whilst having fun. 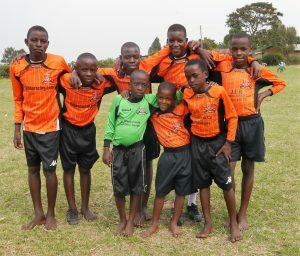 Bridge of Hope Children’s Ministry has been blessed with football kits and netball tops from the UK which has greatly enhanced the programme. The children can now choose to play football, netball, volleyball or use the fun items such as skipping ropes and bats and balls. The current challenge for us is how to select the most vulnerable children for this programme and also keep the attendance numbers to a manageable level. We believe that structured sports can help shape children into healthy, social and active people.